IN 586 BC the Babylonian army destroyed the magnificent temple built by King Solomon several hundred years earlier. The Bible lists (in 2 Kings 24:13; 25:13-18; Jeremiah 52:17-23) the items which the Babylonian army carried away from Jerusalem. Missing from these lists are the important central objects of temple furniture, including the Ark of the Covenant. This reveals that these items never came into the possession of the Babylonian army. Jewish traditional writings, e.g. The Paralipomena of Jeremiah, indicate that these important items were hidden just prior to the Babylonian invasion. Warned of the impending destruction, the prophet Jeremiah is said to have secreted the items in a cave. When the Temple was rebuilt in later years, the instructions for the rebuilding of the Temple fails to make any mention of the Ark being re-instated. Jeremiah had written that the Ark would be no more restored to the people for Israel (Jeremiah 3:16), and so it is evident that the Ark has remained hidden, its whereabouts unknown - that is until modern times. Since the Hollywood film Raiders of the Lost Ark, there has been a proliferation of unsuccessful attempts to find the Ark. But now, through someone who never planned to look for it, it’s exact whereabouts has been established finally. RON never intended to search for the Ark of the Covenant. At the time, Ron was conversing with an influential person from the Department of Antiquities, who subsequently offered to provide the necessary permits for Ron to begin excavating at the site. Ron knew the experience was supernatural. But before accepting the offer, he decided to return to the United States to research the subject more thoroughly. After studying the subject carefully, he felt that the location pointed to was quite within the realms of possibility. In 1979 he returned to begin excavating. Over the centuries, Jerusalem has been destroyed and rebuilt several times, and each time the new city has been simply reconstructed on top of the old. Therefore Ron’s crew had to remove many tons of rock and debris in the course of their excavation. All of it was sifted through for artifacts, a requirement of the Department of Antiquities, which they would always comply with. Ron and his team dug along the base of the escarpment where he had pointed, in the vicinity of the “skull face”, a known Roman crucifixion site. During the next two years, in between his obligations as an anaesthetist, Ron and his team made some wonderful discoveries, and provided details to the authorities of their finds, along with any artifacts they retrieved. As they excavated along the cliff face, they came to a base of bedrock with some squarish holes. Ron surmised that they were cross holes. They were approximately 12 inches square and the central one was covered with a stone plug, apparently to keep debris from falling into the hole when it was not being used. Ron also noticed that there was a large crack that extended down the cliff face and into this central cross hole. It would be over a year later before he would learn that this crack extended 20 feet into the bedrock. 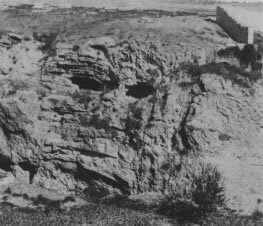 Considering they were excavating close to the “skull face” on the Golgotha escarpment, Ron knew they had found the probable place of Christ’s execution. The fact that the location was in the area of the Calvary escarpment and fit a number of aspects of the Biblical description made it a likely spot. However, Ron was not searching for the crucifixion site but the Ark of the Covenant. So he continued to search the cliff face for an opening of some kind. If the Ark was here, it certainly would be hidden in a cave, Ron knew. Finally, the decision was made to break through the rock of the cliff-face. The rock is extremely hard, and it was difficult work, yet it wasn't long before they broke through into an open space. Enlarging the hole, they found the mountain was honeycombed with natural cavities and tunnels. Crawling through, they were inside the actual mountain called Moriah. Ron and the team spent many hours chiselling through cave walls, searching for adjacent tunnels. This was difficult, arduous work, and took a toll on both health and spirits. But the work would ultimately pay dividends. In 1982 he finally located the cave chamber which held the long-lost temple items. Ron later realised that had he discovered the chamber containing the Ark without first searching the base of the Calvary escarpment, it is very unlikely he would have discovered the original crucifixion site. He then knew that providence had led in the circumstances prior to and during the entire excavation. It was not human wisdom which led to this discovery.